This pyramid is the best preserved in the necropolis and owes its name to its singular shape: almost half way up the face the angle of the slope passes from 50*40’ to 43*. The pyramid has two entrances which lead to 2 chambers with corbelled vaulting like the Grand Gallery of the Great Pyramid of Khyfu. 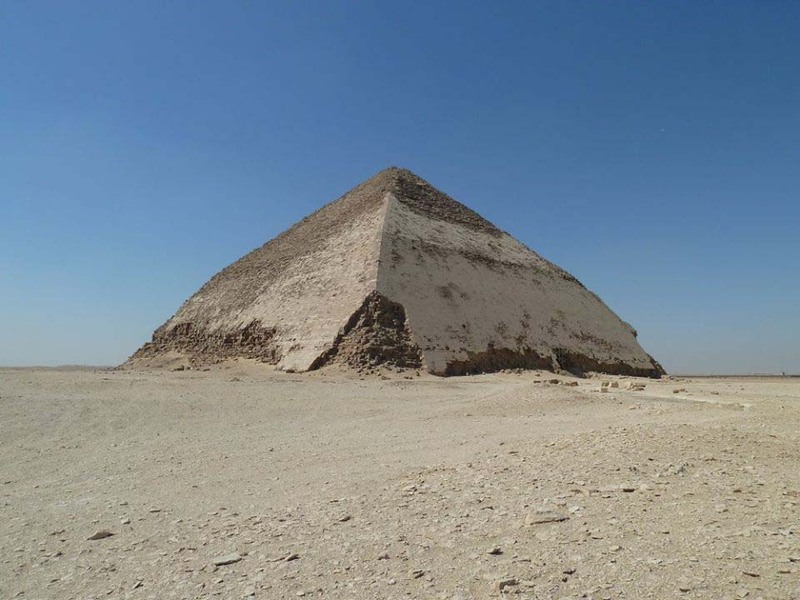 The Rhomboidal Pyramid had a subsidiary pyramid on the south, originally 26 m high. 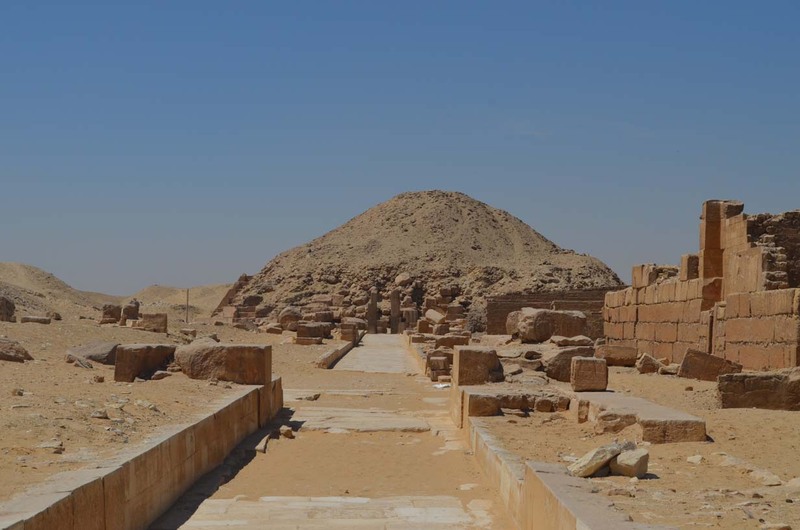 The Bent Pyramid is King Senefru’s second attempt to build a complete smooth-sided pyramid. 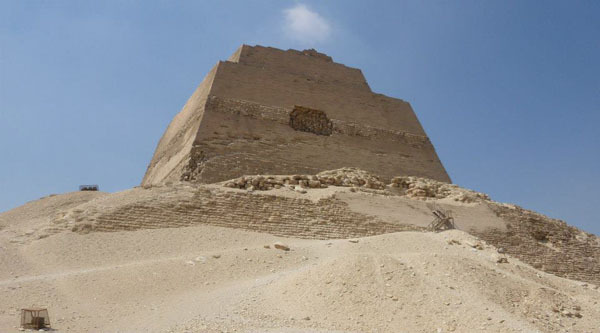 The first one was in Meidum, 100 kilometres south of Modern Cairo. 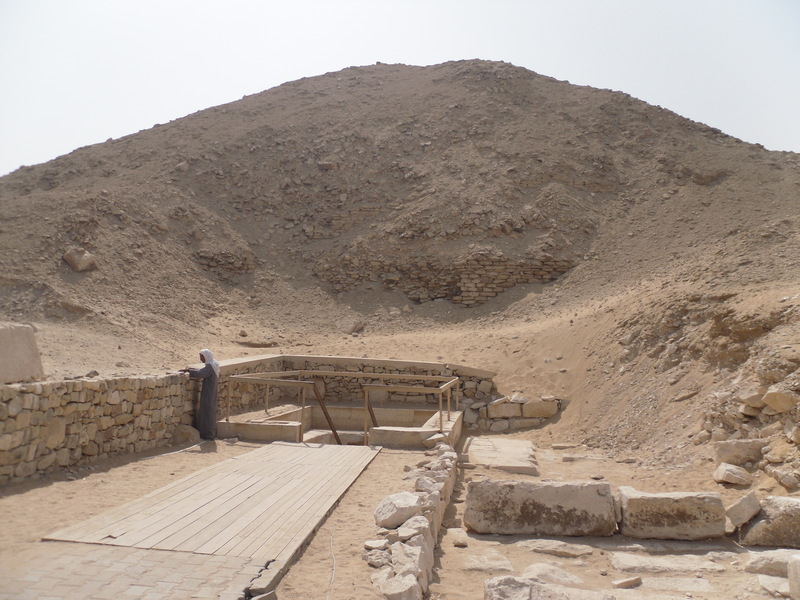 Archaeologists believe that the Bent Pyramid is a transitional form between the step-sided pyramid of king Djoser in the Saqqara Necropolis and smooth-sided pyramid, such as Senefru’s Red Pyramid in the Dahshur Necropolis and those of the Giza plateau. 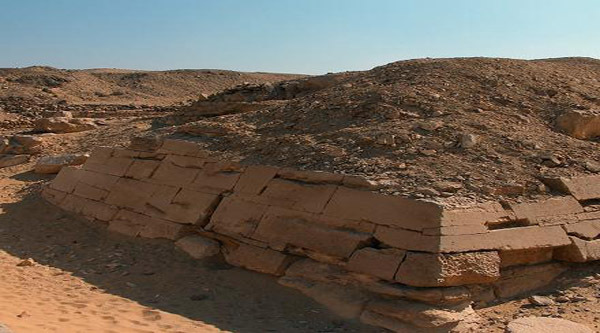 The bent pyramid is a unique example of early pyramid development in Egypt. 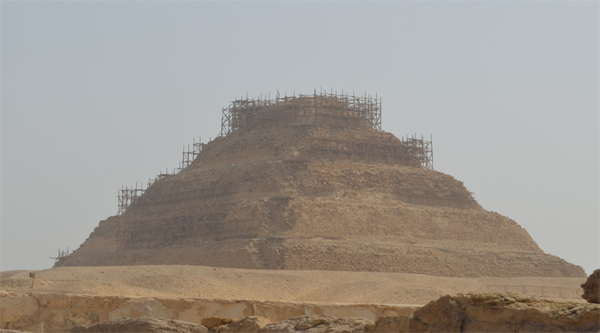 It has been suggested that instability during construction of the Bent Pyramid's steep incline forced the builders to adopt a shallower angle to avoid the structure's collapse. 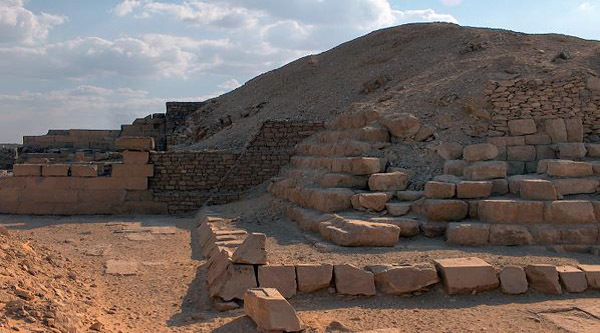 This theory appears to be borne out by the fact that the adjacent Red Pyramid, built immediately after by Senefru, was constructed at an angle of 43 degrees from its base. The southern Pyramid of Snofru, commonly known as the Bent Pyramid, is believed to be the first Egyptian pyramid intended by its builders to be a "true" smooth-sided pyramid from the outset; the earlier pyramid at Meidum had smooth sides in its finished state – but it was conceived and built as a step pyramid, before having its steps filled in and concealed beneath a smooth outer casing of dressed stone. 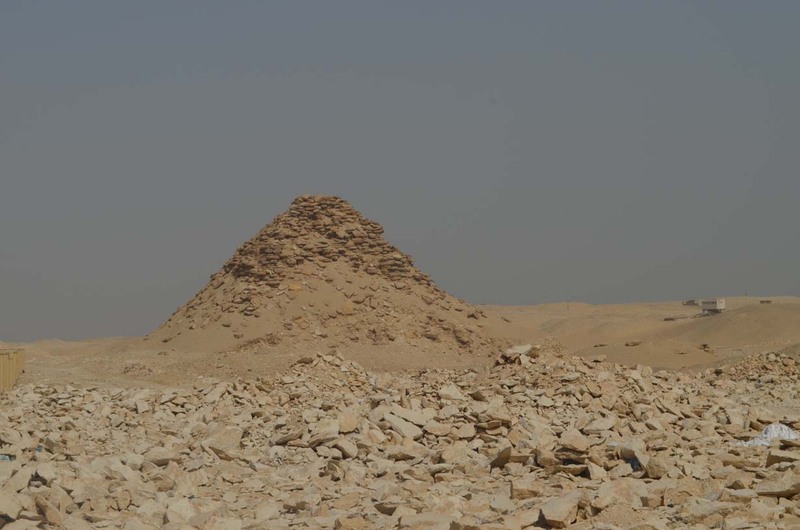 As a true smooth-sided structure, the Bent Pyramid was only a partial success – albeit a unique, visually imposing one; it is also the only major Egyptian pyramid to retain a significant proportion of its original smooth outer limestone casing intact. 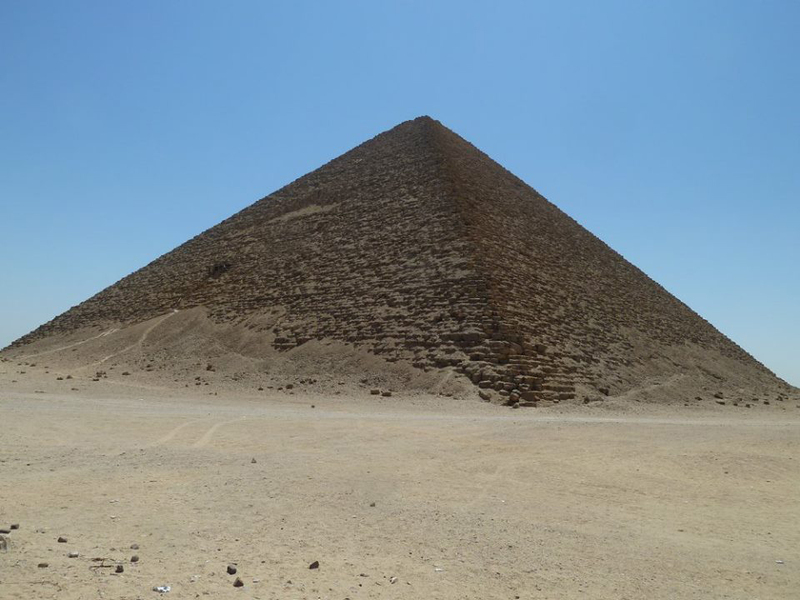 As such it serves as the best contemporary example of how the ancient Egyptians intended their pyramids to look.